Hai Van Pass – Đèo Hải Vân lies just north of the central Vietnamese city of Danang and is part of the Annamite range that extends down to the East Vietnamese Sea. The name means Cloud Pass or Ocean Cloud Pass as a result of the constant fog that can cover the mountains even while the lower coast remains clear. This is due to the warm air from the ocean meeting the mountains and condensing. The top of the pass is only 496 metres tall but drops straight down to the ocean within 1 km. If you’re getting to Danang or Hue from Hoi An, information on how to get over the Hai Van pass for the best experiences and best views, by bicycle, car, motorbike or train. 800 to 1000 years ago the pass was rumoured to be a physical barrier between the kingdoms of Đại Việt in the North of modern day Vietnam and the Champa Kingdom in the south. With the limited transport options of that period the Hai Van Pass was the perfect place to seperate the two kingdoms. The modern day divide between Danang City Municipality and Thừa Thiên-Huế province in the north is much more laid back with just a sign to farwell you from one province and a welcome to the next. 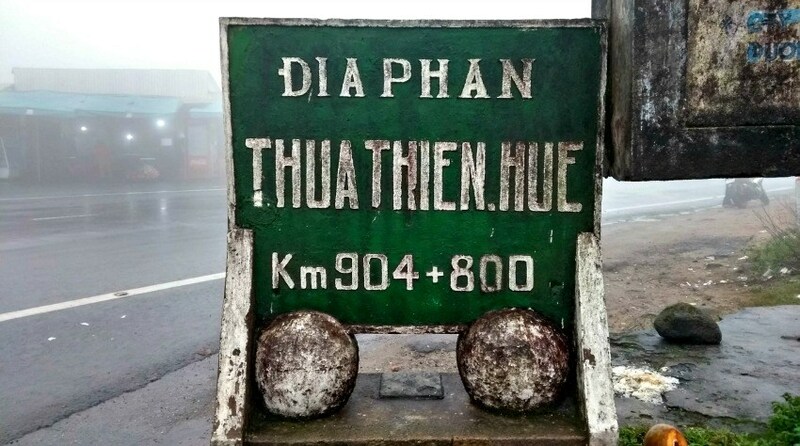 This marker at the top welcomes you to Thua Thien Hue province and lets you know it is only another 800 km north to Hanoi and you’re a mere 904 km north of HCMC. Note how thick the fog was up here at an altitude of 500 metres. There are actually 3 ways to get across Hai Van pass with two by roads and the third by train, a scenic route which runs along the coast next to the pass. Highway 1 heads straight through the pass utilising the 6.28 km tunnel which was built in 2005 and is Southeast Asia’s longest tunnel. The original road, Đèo Hải Vân in Vietnamese, goes up and over the pass and is by far the most scenic of the two road choices with next to no traffic. 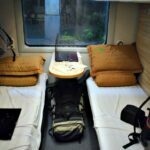 The other choice is the train which is one of the most scenic, not just in Vietnam but in Asia as it hugs the coast line giving views of unspoiled coast on one side and the hills to the other. First you’ll have to get from Hoi An to Danang and from there pick which way to go across Hai Van pass. 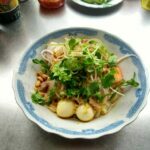 There are two ways to head to Danang from Hoi An, the scenic coastal road or the inland highway. Coming from the airport most will take the inland road but the coastal road is so much better with views across the East Vietnamese Sea. Both journeys are approximately 25 km in distance and take under an hour. The two roads that go through the Hai Van tunnel or around the top of Hai Van pass both leave Danang from the same point in the northern part of the city. Just past the bridge over the river Song Cu De (two bridges now after suffering heavy bombing by the VC in the Vietnam war) the next intersection on road QL1A is the divider for the two different roads. Turn left and you’ll be on Highway 1 heading to the Hai Van tunnel or for the scenic climb into the clouds continue straight ahead on Deo Hai Van road. It is 43 km to the junction of the Hai Van pass from Hoi An if you take the inland route and will take about 70 minutes. This includes going around the outskirts of Danang on the QL1A road which is a busy road running mostly parallel with Highway 1. While slightly scenic this road would be my second choice and you won’t save you much time overall. Going the longer coast road and along Danang bay it is 51 km and takes about 80 minutes depending on traffic. This route follows the coast all the way to Danang bay where it goes over the Cầu Thuận Phước bridge and hugs the Danang bay beaches till joining highway QL1A to cross Song Cu De bridge. From here it is only a short distance to the highway intersection. A longer journey, this is much nicer and you’ll see so much more. From the fishing port with locals unloading their morning catch to the hustle and bustle of daily life in Danang. The chance for speeding cars and chaotic traffic is greatly reduced on this journey compared to QL1A which is a big factor for me. One of the best ways to go over the pass. Less physical than riding a pushbike up to the top you can still stop where you please to take photos With a guide they can explain everything as you go along from the history of the region to the towns you will visit. It also allows you to explore further. Vịnh Lăng Cô or Lang Co Bay is a beautiful fishing village at the end of the pass on the way to Hue. The view from the road halfway up the Hai Van Pass. In the bottom left corner you can see the train tracks winding along the coast. Both Hoi An and Hue are big tourist destinations in central Vietnam and being only 140 km apart it is easy to travel between the two. Once over the Hai Van pass it is only another 80 km to Hue via road or rail. The train line between Danang and Hue forms part of the North South rail network in Vietnam. Unfortunately the train doesn’t stop in Hoi An so you’ll have to first get to Danang. Despite this inconvenience this is well worth the hassle to experience the train journey. This particular section of the track is some of the most stunning not just in Vietnam but in the world. Hugging the coast on one side and the rugged mountains on the other side. Numerous departures each day from both directions. From Danang to Hue there are 4 departures each day. The two best ones are the 12.46 pm – 2.5 hours or the 14.13 pm – 2.5 hours. Cost is about $10 US for a soft seat. The other two trains leave and arrive in the dark one leaving at 3 am and another at midnight. Both 2.5 hours for the 103 km trip. Check times and costs as they are subject to change and expect certain delays as the track is only single which can lead to back ups. The easiest way from Hoi An to Hue is by bus or private tour and or car. Both have there pros and cons. Lets start with the bus first. Buses leave numerous times of the day and night so getting a seat won’t be hard. Cost per seat is normally under $10 US and you’ll either have a sleeper (at night) or a normal seat style coach or mini bus. The pros with the bus is that it is frequent and quick and the cheapest option for budget conscience travellers. The cons are that 90% of the buses head through the tunnel and you will miss out on the great views from the Hai Van pass. You may want to see the tunnel and not the high pass so this may not be a con. One thing is that you can’t stop when you want to take that photo or explore that little village on the side of the road. It is from point A to point B and besides a possible restroom stop. The road heading up to the Hai Van pass summit. Near the top the cloud cover becomes thicker until the top if you’re unlucky enough. The road isn’t particularly steep never getting more than 10% gradient. 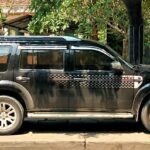 Private tours or just hiring a private car and driver is my preferred choice. This costs significantly more (around $65 US) than a bus ticket, but if there are 4 of you that cost suddenly reduces dramatically as it is per car not person. With the car option you can stop as and when you please . You are free to take in the views going up and down the pass plus the fort on the top of Hai Van pass. Taking the scenic route over Hai Van pass you will emerge above the beautiful Lap An Lagoon and Lăng Cô fishing village. This is a great stop for lunch and to take some photos of all the fishing boats. From here you can take the slightly longer route along the coast to Hue which is much better and more relaxing than the busy highway 1. Having a guide will enable you to see everything and make the most of your journey from start to finish, seeing places that only a local may know about. With the DMZ 2 hours drive north of Hue the Hai Van pass didn’t see any direct action but was an important supply line from the American’s main base in Danang to resupply troops when the weather made it impossible to do so by air. A lot of money and effort was made to keep the steep and dangerous pass open to trucks and army supply trucks as it was the only way north for vehicles until 2005 when the Hai Van tunnel opened. The bridges below the pass on the northern edge of Danang were repeatedly bombed as it was easier and gave better results. Floating pontoon bridges were a common sight during the American offensive in Vietnam and Danang was no different. Is It Safe to Ride a Bicycle Over Hai Van pass? I made it up the Hai van pass in thick cloud in a little over 30 minutes from the bottom. Unfortunately no view today. The map behind lists some of the things I would’ve seen. Yes you can. I’ve done this on my bike but it will need to be a decent bike with gears as there is 9 km of climbing once you leave the coast and the flats of Danang. The climb is gradual with a few 10% gradients thrown in. Traffic is light with only livestock and fuel trucks using the road. Neither are allowed through the tunnel for safety reasons. At the top of the pass there are stalls to buy water, coffee, drinks and snacks. The first cafe has the best views across the bay back to Danang if the weather is good. It is worth noting that you can’t ride a bike of any sort including motor bikes through the tunnel and have to put it on a transport and catch a bus through. Before the Hai Van pass tunnel all road traffic used the coastal road that wound up and over the top of the pass. A single lane each way this was a major cause of traffic jams and delays to journeys. In the late 90’s foreign investment was starting to flow into Vietnam and both Japan and the United States companies co funded and designed the tunnel. At 6.28 km long and 11.9 metres it is the longest tunnel in Southeast Asia and took nearly 7 years to complete. Work started on both the north and south simultaneously. Japan and Vietnam constructed the southern portion of the tunnel and a consortium of Korea and Vietnamese construction companies worked on the North. There is a parallel tunnel next to the main tunnel which is used for maintenance and is connected like most tunnel systems by cross tunnels linking them both the length of the tunnel. There is talk of opening this up for cars due to demand on the original tunnel that is only a single lane each way. No confirmation if or when this would happen though. Due to the length and danger of the tunnel certain restrictions are in place. No pedestrians, motor bikes or pushbikes are allowed through the tunnel. You are required to leave your bike and have it transported separately while you are transferred in a bus. The cost is very reasonable compared to European tunnels. Cars and bikes are 25000 ($1.10 US) Dong, Push bikes are 15000 Dong (70 cents US) and pedestrians 10000 Dong (44 cents US). It is in operation 24 hours a day but does have a reduced service and slight surcharge between 11 pm and 6 am. Hai Van tunnel has made the journey from Danang to Hue 20 km shorter and as a result it is between 30 to 1 hour quicker between the two cities. 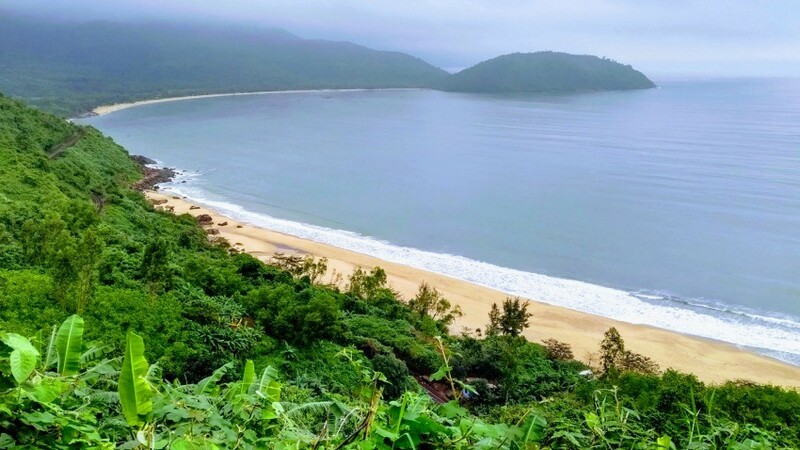 Which ever way you go north from Hoi An or Danang to Hue or even if you’re heading south you definitely have to see Hai Van pass and experience the beautiful area that surrounds it.